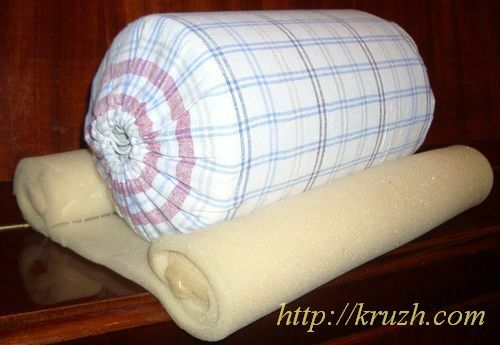 When a rest is choosen, a lace maker must take care to pevent rolling of the pillow on the surface. 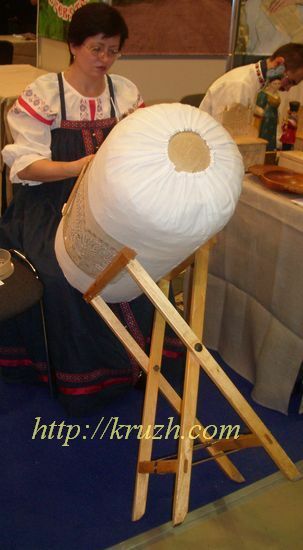 For this purpose it is enough to lay something under the pillow, for instance a piece of porolon with edges rolled to form cylinders (Fig.2.2). 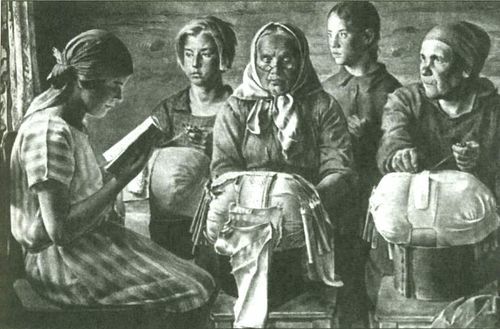 Lace makers in Russian provinces many years ago used to set a pillow into a basket plated of withy or rolled of birch bark (“lookoshko”). The basket was rested on a stool (Fig.2.3). Quite often any accidental box happens to become a rest. The box is set as well on accidental surface like a chair, a stool or a table. 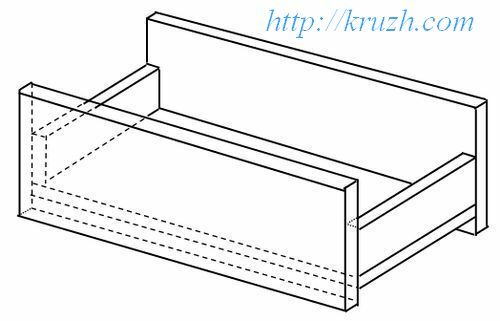 One can find instructions in some manuals how to make the simplest rest for a bolster. The rest consists of details: two desks with semicircle cuts and two sticks that join the desks. Authors made their first rest of five desks, spending 30 minutes (Fig.2.4). – besides the bolster fidgets in the rest! However there are no reasons for pessimism. All self-educated lace makers start so. 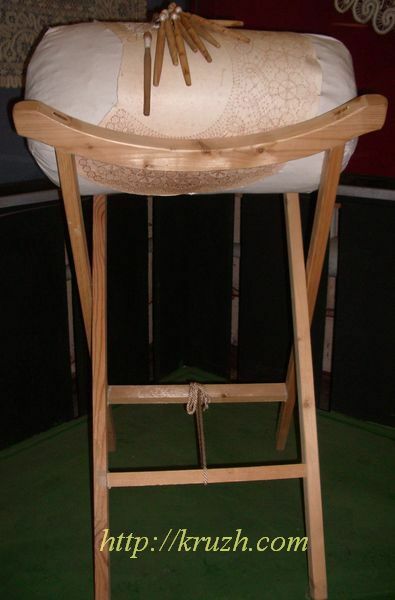 Beginners in Russian traditional lace making centers are tought using rack-“goat”. It is analogous to rack used to saw fire-wood in Russian north villages but looks better because of more skilful work. An angle between frames is fixed with a ribbon (a cord, a small strap) that binds lower (sometimes – upper) slats of frames. Despite of incomplete accordance to ideal “goat” is prevalent rest type in all Russian provinces due to simplicity, reliability, cheapness of construction. In addition racks are made of local materials – birch wood, pine wood, white spruce (Fig.2.5). 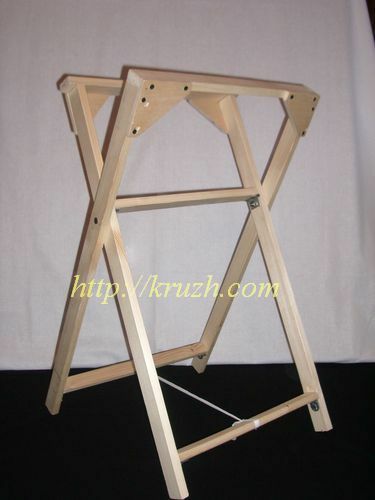 European lace makers use racks too. An Italian rack has a peculiarity – frames are different at height. Authors of the book tested rack too. 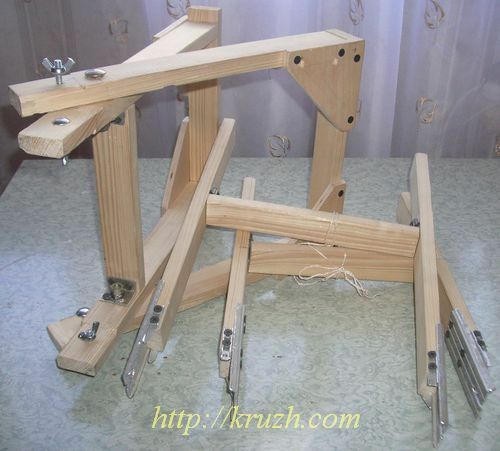 Our experience showed that it is enough to be able to use a hack-saw and a drill to make a “goat” in improvised home workshop during 2-3 hours (Fig.2.7). – horizontal flat that holds half-axes. It is understandable that described technology is admissible in domestic conditions only to make a single exemplar. 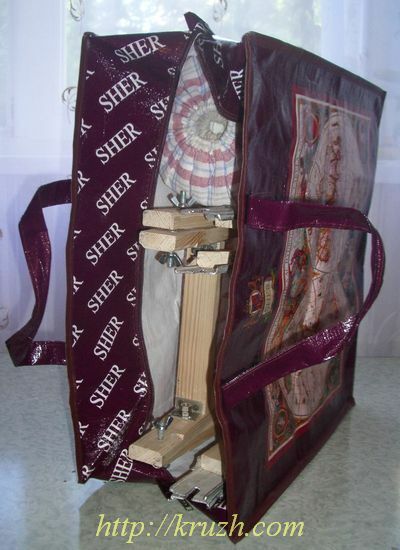 If a training class is to be equipped with 10-15 racks or a party of racks is to be delivered to lace makers working at home, rests must be made professionally using another materials, details and stationary workshop equipment. Junctions of horizontal and vertical slats are subject to the greatest destroying load every time when lace maker inclines the heavy rest towards herself (Fig.2.8). At this moment the rest has two fulcra only. Long lever arises for the gravity. Junctions become rickety after multiple inclines for along workday. That’s why such a simple tool must have a great safety margin in mass production. Stationary rest is a constant equipment of the work place at craft-work or at home. However a portable rest is necessary as well. It would be very useful for a skilful lace maker who gives master-classes and for a pupil who takes lessons of lace making. – a sectional (split) rest. Authors of the book chose the third variant (Fig.2.9). Both frames of the rest splits at two approximately equal parts that can be joined without using special instrument in several seconds. It becomes possible due to wing-nuts (Fig 2.10). The dismounted rest and bolster can be placed easily at the sack (Fig.2.11). There is still enough room for the bobbin set in the same sack. Total pack has sizes 46 х 40 х 18 cm. Its weight is 2.1 kg (without bobbins).